· Commonwealth Avenue Mall: This linear path through the heart of Back Bay was said to be inspired by grand French boulevards on the other side of the Atlantic. The green alley of leafy trees is a narrow link in the Emerald Necklace and features public art and benches to sit and take in the stately mansions nearby. French chic without the airfare! · Harborwalk: This waterfront path takes you past some of Boston’s top sights while never breaking the view of iconic Boston Harbor. Whether you’re lacing up to run morning sprints, attending a boot camp workout (frequently offered in several of the adjoining parks) or simply looking to enjoy a picturesque picnic, the Harborwalk truly has something for everyone. · Boston Public Garden: A key link in the Emerald Necklace, this park is a lush retreat any time of the year. Featuring the plantings of 14 city greenhouses, the gardens are dotted with tulips, roses, and flowering shrubs to enjoy while cruising the lagoon. From selfies with the George Washington statue (maintaining a watchful eye over the Arlington Street entrance) to a ride on a swan boat, the Public Garden is Boston’s best kept lawn. 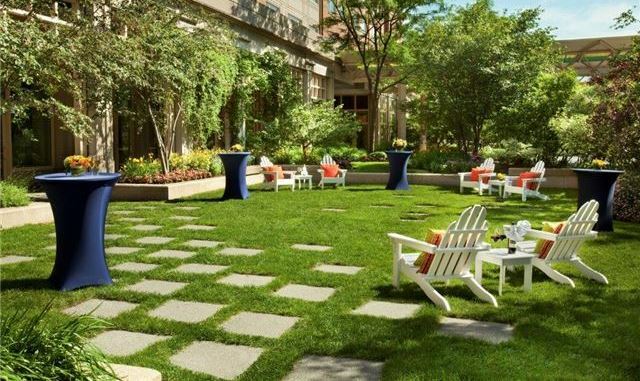 · Seaport Plaza Garden: You don’t have to go far for a leafy retreat! Over 2.1 acres of parks are included in the Seaport Place campus. Seaport’s Plaza Level garden features Adirondack chairs perfect for afternoon reading near our herb garden (some of which you’ll taste at TAMO). It’s a green getaway from Boston’s original green hotel!